-Add to that a big handful of defrosted, frozen peas, 2-3 cloves of garlic, a handful of Asiago cheese, the zest of 1 large lemon, a pinch or two of salt, and a good amount of extra virgin olive oil. -Pulse until everything is equally mixed and looks like a slightly thin pesto. You may need to keep adding oil until the right consistency is reached. 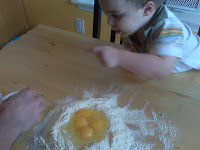 -Drain the pasta and beans and add to a large bowl. Drizzle with some extra virgin olive oil and sprinkle with a good handful of grated Asiago cheese*. Toss to coat. 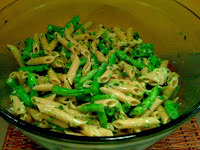 -Add your pesto to the bowl and toss to combine. I agree that I love the beans–and the peas in the pesto. Your picture looks lovely! Thanks ladies! It is a great dish when you're thinking of being healthy..it's not 'diet food' but very health conscience. And cutting the beans makes it just a bit cuter…and fun for little ones too.